Apex Legends is smashing records left and right just one week after it’s launch. Without any prior marketing the game has gained over 25 million players. Keep in mind that’s total players, and not players online at once. The 25 million players makes it one of the biggest launches in video game history. Keep in mind, competitor Fortnite currently has roughly 80 million players and has been out more than a year. The massive launch is fueled by it’s influencer marketing, fun game play, and gamers distaste in their current favorite game. Prior to launch their was very little teased or even announced about Apex Legends. When the game did launch the rapid growth was fueled by influencers and content creators that took the game to the #1 spot on Twitch, trending pages on YouTube, and trending on Twitter. Top names like Shroud, Ninja, Courage, Dr. Disrespect, and more all started streaming the game upon launch. To help with the growth is the massive is the fun “new” style of battle royale game play. The game combines parts of major titles like Overwatch, Call of Duty, and Fortnite to create a massive battle royale that players have been looking for. The hero abilities are somewhat “Overwatch like”, while adding the smooth movement and weapon play as Call of Duty, while garnishing the fast paced battle royale style of Fortnite. Players who are unhappy with the current state of Fortnite, or unhappy with Overwatch flocked to the game for something new. 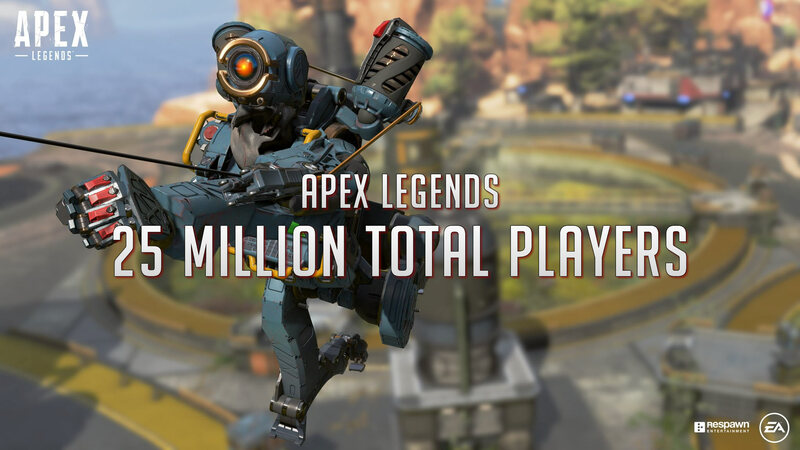 Apex Legends officially made the announcement that they reached 25 million total players on their Twitter page on February 11, 2019.